Rated 5 out of 5 by GP NW from Menacing Perfectly constructed, totally overbuilt, surprisingly smooth... everything you expect from Rogue. I wish this came with more hardware, to protect the upright of the rack from metal/metal scratching - specifically, a collar for each side of the landmine instead of just one, a fatty washer, or the more permanent option: a longer bolt that will work on monster lite racks (the included bolt is for infinity width racks)... overall not a big deal, washers are easy to find. A decent fix for me was actually to throw this old grip donut on for protection. Killer product, as always. No nonsense, no drama, just high quality steel in a menacing finish. Rated 5 out of 5 by AlphaBravo from Great quality and versatility addition to the gym Quality is top notch and my Ohio bar fits right at home, snug and tight in the sleeve. Obviously this is a cost effective addition to your stand/rack/rig to add versatility by way of shoulder and back work safely with a barbell. One thing to note that I could not find before purchase is for the S-2 or any Stand user, the land mine will NOT attach properly to the holes in the legs of the stand and must be attached to one of the risers. I mention this because my landmine sits at home on the first hole above the stand riser, so about 10" off the ground. No big deal, but thought I'd make the S series users aware if they were not in the event low placement is required or desired. Rated 3 out of 5 by BTH22 from Solid product with very poor instructions The product is solid but the instructions that came with it was completely wrong. They sent me two bolts, one large T bolt and one standard hex bolt, which confused me since the hex bolt served no purpose. They also didn't mention anywhere that the longer T bolt requires a 5/32 hex key to remove the nut so you could insert the longer screw through the rig leg. Also, would have been nice to have some rubber washers to avoid metal-on-metal. Overall, this should have been a 5 star rating but with no instructions, missing washers and a slightly frustrating experience, I had to knock down 2. Rated 3 out of 5 by snowman418 from Great addon... missing parts! Like others have posted, the lack of separation between the landmine and your post means there is metal-on-metal contact. A single set of 5 reps had the landmine starting to carve out slivers of steel from my Infinity rack. Upon taking off the landmine attachment, the paint was completely stripped off with a nice exposed steel frame (which will undoubtedly rust...) I bought some steel washers to provide a little give between the attachment and the frame, but it seems like a nylon or plastic washer would be the best fit (and not damage the rack). Also, the instructions provided are incorrect and don't work. Rated 3 out of 5 by AndB from A couple washers away from perfection First of all - great product, heavy duty, no issues. But Rogue, why couldn't you throw in a few washers to get this thing off the rack so it moves easily and doesn't scratch the heck out of everything? Great includes two mounting options, but should make clear that monster lite can't use the bolt so not scratching head why can't make it work. 2 star downgrade for two needed washers. Yes, I know where Home Depot is, but shouldn't need to pay a visit. Update - Rogue label was loose when arrived, now completely separated from base. Replacement received. Rated 2 out of 5 by Gregbinghamton from Incredibly useful...Kinda Purchased and slightly confused why it only connects on the sides of the posts. Unfortunately for me I had to go purchase a longer bolt for this to connect and be used on our racks vs the bolts that came with it. We have the rogue wall mount rig. Don't have a photo but if I can edit the post I'll upload. 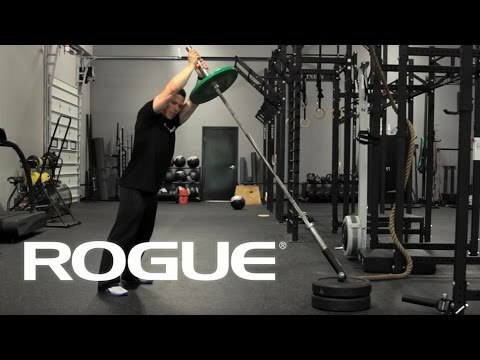 I would recommend to someone who has the sides of their rig open for a barbell to be used on it. Otherwise from the directions it runs into the post next to it. Rated 5 out of 5 by craigheon from I love the versatility! I just recently purchased this to go on my SML-1 squat rack. I love the versatility it offers. Deadlifts, shoulder presses, russian twists... you name it, this thing does it! Very high quality (as always with a Rogue product)!